What: A premiere shopping event and signature fundraiser celebrating the season’s must-have fashion. 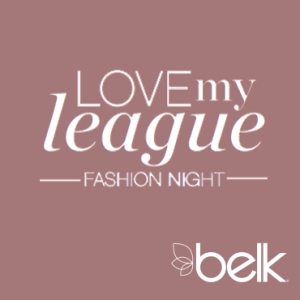 When: Sunday, April 17, 2016, 6-9:30 p.m.
Background: Tickets are now available for the 2016 Love My League Fashion Night (formally known as Fashion Forward), a premiere shopping event presented by the Junior League of Raleigh and Belk. The event will preview the latest in Belk’s spring fashions and trends. In addition to a discount from Belk on purchases made during the night of the event, guests will be offered heavy hors d’oeuvres, desserts, wine, specialty drinks and non-alcoholic beverages. Proceeds will support of the work of Junior League of Raleigh. To purchase tickets, visit www.jlraleigh.org/fundraising/love-my-league/. About the Junior League of Raleigh: The Junior League of Raleigh is the local chapter of the Association of Junior Leagues International, an organization of women committed to promoting volunteerism, developing the potential of women and improving the community through the effective action and leadership of trained volunteers. To learn more about the Junior League of Raleigh, visit www.jlraleigh.org.